It appears that size really doesn't matter for the new D.C. Lottery truck. The retrofitted food truck, which was supposed to launch in early July, hit a road bump when it was discovered that it was too long (by about 7 feet) for D.C. regulations regarding mobile food vendors. But D.C. Lottery argued that since the Lucky Lottery Mobile was only selling lottery tickets and not food, those regulations didn't apply. And finally, after some regulatory wrangling, the truck will make its first street corner appearance Thursday. It will be parked outside of the L'Enfant Plaza Metro station (600 Maryland Ave. SW) from 10:30 a.m. to 3 p.m., selling lottery tickets and giving out some free stuff. Purchase a $5 Dubble Bubble scratcher and get a free shaken lemonade in a D.C. Lottery Water Bottle! The lottery truck has made several public appearances at Truckaroos and BBQ battles, but this will be the first time it's venturing out on its own. You'll be able to track the D.C. Lottery truck via Twitter. 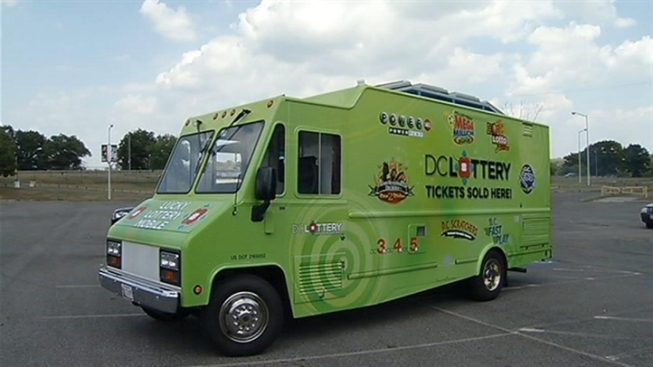 Just like food trucks, the lottery vehicle will alert the public to its location throughout the week. Follow @dclottery.